Hello! I'm Kier & This is my models thread. I haven't been doing this for very long but i am here to show off/release some of my Models. check back frequently as i will be updating the thread as often as i can! This is seriously professional work. I really want to see your showcase activity increase, I would love to see new content. You should add your services to the Graphic Designer Toplist! Some very solid work here my friend! 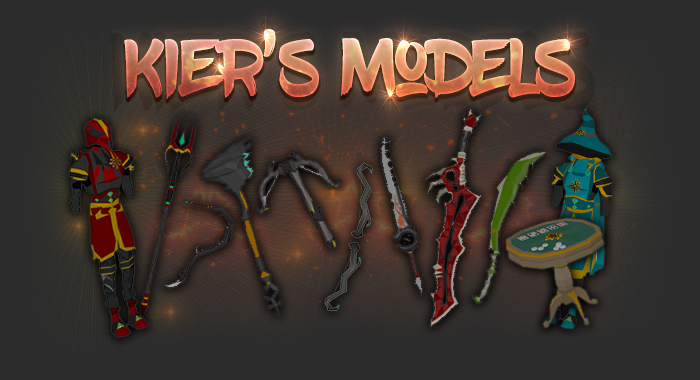 This is pretty cool man are these recolored items or did you make the models yourself? they're all from scratch yes. i need ideas for more designs though so i can get to it! here's a badly rendered image of an AK i made..
also sized/modelled to fit and work on RSPS, swiggity sweg. Another lil Update.. Some WIP Skeletal PvP Armour. Do these come rigged to support animations? oh yeah we can provide anims on the relevant item sets, obviously it adds to the price but that's normal for RSPS modelling services.